Tom Hapgood, center, associate professor and head of the graphic design program at University of Arkansas’ School of Art, teaches undergraduate students in his digital tools and concepts class. B.F.A. sculpture student Brittany Cusanek works on a project in the University of Arkansas School of Art’s new sculpture facility on Hill Avenue in Fayetteville. 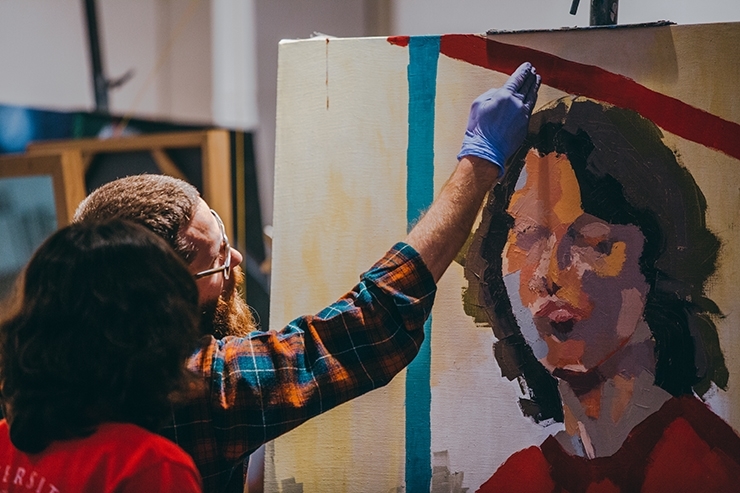 Visiting assistant professor David Andree gives a student feedback during a painting class at the University of Arkansas School of Art. Instructor Adam S. Posnak demonstrates techniques with clay during his University of Arkansas School of Art ceramics class. Visiting artist, printmaker and book maker Amos Paul Kennedy demonstrates letter press techniques during a printmaking class at the University of Arkansas School of Art. About Campaign Arkansas: Campaign Arkansas is the ongoing capital campaign for the University of Arkansas to raise private gift support for the university’s academic mission and other key priorities. The campaign’s goal is to raise $1 billion to support academic and need-based scholarships, technology enhancements, new and renovated facilities, undergraduate, graduate and faculty research, study abroad opportunities and other innovative programs.